On 4th of July, 2018, the President of Turkmenistan Gurbanguly Berdimuhamedov’s book “Turkmenistan – the heart of the Great Silk Road” in Turkish was introduced at the Institute of International Relations of the Ministry of Foreign Affairs of Turkmenistan. The General Secretary of the International Organization of Turkic Culture – Duisen Kaseinov and his delegation, academia members and students attended the presentation. 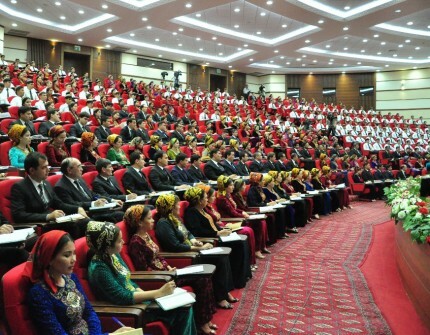 The General Secretary of the International Organization of Turkic Culture – Duisen Kaseinov underlined in his opening remark that “the President of Turkmenistan has presented us excellent books in economics, social sciences, culture, art and other fields. The book “Turkmenistan – the heart of the Great Silk Road” is among them. The General Secretary stated that, the book was translated into Turkish and made available to Turkish audience taking into account historical, cultural, social and spiritual peculiarities of it”. He also clearly expressed his opinions on how the esteemed President of Turkmenistan considered the Great Silk Road as very important historical and cultural event and its vital role in Turkmenistan’s experience. Moreover, the teachers from Gazi university of Turkey have delivered their presentations. They emphasized the role of the Great Silk Road in interconnecting dozens of states with trade, necessary information and cultural relations from the perspeсtive of Turkmen nation’s history and its cultural values, states’ present and future development. It has been repeatedly mentioned that, it is of great importance for the International Organization of Turkic Culture. Thus, this book clearly demonstrates long-standing economic, trade and cultural relations of member-states of the International Organization of Turkic Culture.The Great Silk Road was the connecting link among states and it helped to enrich their history and culture. Such views were the central point of presentations. In the end of the event, the participants expressed their sincere gratitude to the esteemed President for presenting this excellent book.